The prominent Midnight desk globe is the perfect mix of style and functionality. 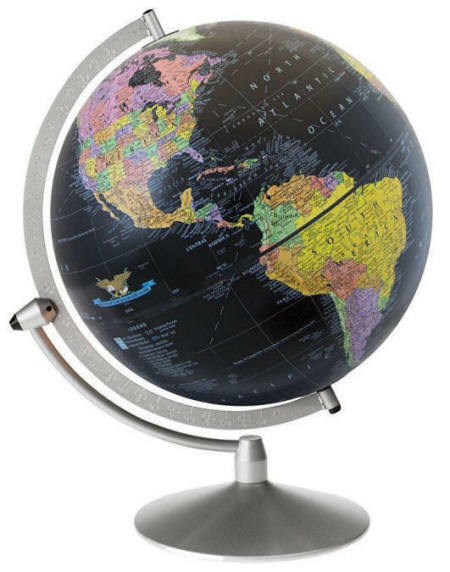 This black world globe features a silver metal tapered base and a silver steel, gyro-matic semi-meridian which allows 360 degree turning for easy viewing of any part of the world. Features political boundaries cartography, thereby each country is shown in a different color. * Globes with raised relief better emphasize the mountainous areas of the world. They are there so that you can see and feel the mountains although their actual height on the globe does not have any relationship to the true relative heights of the mountain ranges.